Let’s see the 漢字 ( = Kanji) first. = Karera wa bimyou na kankei da. = They have a delicate relationship. So these are some standard uses of the word. But younger people have started to use it when they want to make their statements less offensive or direct. 「微妙」( = Bimyou) Sometimes we write in Katakana. 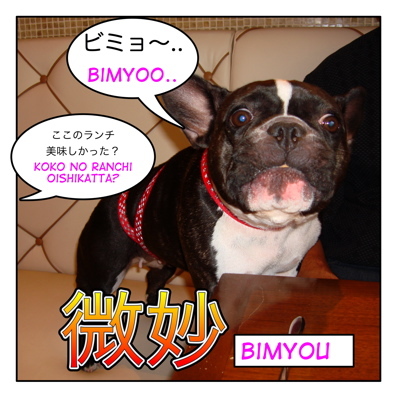 ビミョー！( = Bimyou) for a slang. So when someone asks her if she liked the lunch, she says 「ビミョ〜(or 微妙)…」( = bimyou). She didn’t like the lunch. It could be really bad or somewhere between 「まずい」( = mazui) “bad taste” and 「普通」( = futsuu) “normal”. = Kore, atarashii fuku nanda kedo dou omou? It implies you don’t like it so much — but you never actually say anything negative. Of course, she won’t be happy with your answer, but it’s better than having said it clearly. Remember this next time your girlfriend asks you if she looks fat in something. It is a very convenient word when you don’t want to give them a direct answer. You might hurt your friend’s feeling or cause some problems. But if you say, 「微妙…」( = bimyou) , you can avoid the awkwardness. = Ashita made ni sono shigoto dekiagari masu ka? = Uun, chotto bimyou desu nee. It implies it is difficult to finish it by tomorrow, but you don’t want to tell your customer you can’t make it or it is difficult to do so. My email address was wrong in that one. Sorry! Hello! I’m living in Japan and seeing someone. When I asked about our relationship status they said 微妙な関係だ. In English they said “it’s a gray relationship.” I’m not sure how I feel about the translation or meaning of this phrase. The Japanese person holds my hand and kisses me in public. They tell me all the time “好き、めっちゃ好き、大好き”. I don’t what the feeling behind 微妙 is. Is it bad in this situation? Could I look at this as just dating? Not ready for a relationship? Is this like セフレ？ I just don’t fully understand and we have a bit of a language barrier. Who said 微妙な関係だ? The guys you have been dating? If you ask them “私達の関係ってどんな関係？” = What is our relationship? and they answer that, they don’t want to make any commitments so your relationship doesn’t sound exclusive. I am sure they do have feelings for you. But a man who says 好き、めっちゃ好き、大好き and describes the relationship, 微妙…It is dubious. So basically, bimyou means “meh”? Haha, yes. But it’s a little more subtle. Thank you for the answer, it’s very clear ! Thank you, Maggie sensei ! Hello! It is always nice to hear from you! They are both very similar and subtle ways to decline but there is a slight difference. 1) -> I think you have declined for sure. And I wouldn’t ask you why because obviously you don’t want to give me a specific reason. 2) -> I would also take it as “No!” but it gives me an impression that you might be able make it and you are not sure about that yet. But you are right. If I ask my friends out and they say 1) or 2) , I wouldn’t push you anymore. You can also use “chotto” and “bimyou” together. Hope my answer is not so bimyou…. I saw this on Gimmeaflakeman and followed the link here. Thank you for your comment! Arigatou! !